the Communications software for the hp 39gs, hp 40s and hp 39g+. This is a single package containing everything that you need to have in order to use the cable that should have been in your package when you bought your calculator. The Comms software lets you send and receive programs, notes and aplets to/from the the PC. The ADK39 lets you edit them once they are on the PC. Just download the package into an empty directory, open it, and read the instructions here on how to install onto your PC in the README.TXT file it contains. The files are contained in a compressed ZIP file. You will need to extract them before you can use them. The easiest way to do this is to right click on the ZIP file and use the Windows extraction wizard. new hardware and pops up the wizard to ask for the location of the driver. If this happens the easiest way to cure it is to use the 'New Hardware' wizard to tell it to look for the drivers in a particular location. On the pop up Windows "Detect" dialog, tell it not to look on the web but instead to look for the driver in a specific location (tick the box). Tell it then to look in C:\Program Files\Hewlett-Packard\USBDriver. It will tell you that the driver is not one that's registered with Microsoft (oh, dear we shall die of shame!). Tell it to install anyway and it should then work correctly. If not then the most likely cause is low batteries. You need really fresh batteries to link to the computer. If you already have the communications software installed and working then you may only need the ADK39. It is absolutely essential for anyone wishing to develop aplets or programs for these calculators, or for people wishing to create large notes without having to type them on the calculator. Originally the only version developed by HP was for the HP38G but a talented user called Yohan in France produced a version which will allow you to create and edit HP39G and HP40G files. Emu48 is a great program written by Sebastien Carlier and Christoph Giesselink, and enhanced by Jean-Yves Avenard, Eric Rechlin and myself, amongst other people. It is free software and you can use it and distribute it freely subject to certain conditions (see README.DOC for details on this). The package you can download from this page will emulate the HP38G, HP39G and HP40G. It will also emulate the 39g+ and 39gs but only in the sense of showing the faceplate. The internals are still those of an HP39G and so does not contain the Finance, Triangle Solver or Linear Solver aplets. A detailed manual (README.DOC) is included with the package. The package you will download from this page is complete and ready to run as soon as you unzip it into its own directory and you can distribute it freely but you must not sell it or include it in any package that is sold for profit. An hp 39gs Emulator: You can now also obtain an emulator from the HP site called "Vapple". I won't give a link because it seems to change quite regularly! Instead, go to the HP site and do a search under "emulator". After following a couple of links you'll hopefully find yourself at a page where you have to supply your name and details of what classes you teach. It also asks for a curriculum but I just put a note that I was Australian and they could have it if they emailed. They didn't. This emulator covers the 39g+, 39gs and 40gs (plus 48gII,49g+,50g) and has some really nice faceplates, including some that (like the 38G shown in the image above) have the keyboard sideways. The package comes with an installation serial number and checks with HP via the internet to see how many times you've installed the emulator. This means that your computer MUST have an internet connection the the first time you run It. After that it doesn't matter. The serial number also stops working after 3 installations. However.... if you contact me and give me proof that you're a teacher then I can get you more installation codes. Email me via my Contact page. The emulator won't load aplets. This is likely to change soon: I've seen a more recent version that will load aplets but it hasn't been released yet (as of Dec '07). If that changes then I'll post the info here and on my main page. For this reason, I use BOTH emulators in my classroom. For day to day operations I use the Vapple because it is significantly better looking and has the same aplets as the students. If I need to demonstrate the use of one of my aplets then I use the EMU48 emulator. An upgraded version of the central program to the emulator is available from the web site of the author Christoph Geisslink . This upgrade incorporates a number of small improvements which are mainly of interest to those using the program to emulate the HP48 and HP49 rather than the HP38/39/40G family. If you want to upgrade then just download it from his site. I haven't bothered incorporating it into my download. One of the big weaknesses of the Vapple emulator is that you can't load aplets onto it. IF YOU HAVE A 39G then you can use it to upload aplets directly to the emulator via the serial cable. If you have one of the later models then you can't do this (they use the USB port) but I've include a lot of my aplets in the package you get here in a zip file ready to be loaded into the emulator. You have to expand the zip file into a folder before you can use them though. For Mac users, the good news is that there is now a Mac version of the emulator! 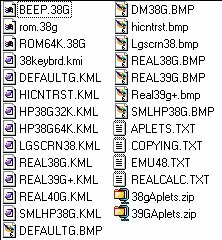 Download the emulator itself (click here) and then some of the files needed to emulate the HP39G (click here). These files can also be found on the page by Pierre Tardy and Da Woon Jong along with extra information and the source code. You should also download the PC version of the emulator and transfer all the files shown right into the folder you put the rest of your Mac files into. These files contain a number of additional emulations of the 38G, 39G, 40G and 39g+ on top of those that come with the Mac package. They also contain saved copies of most of my aplets that can be loaded into the emulator (the zip files). Expand those into separate folders inside your emulator folder if you want to use them. For Unix users: You have first get your own version of the emulator program for Unix, written by Ivan Cibrario Bertolotti, called the saturn program which already covers the 39G & 40G. There are also adaptions to include the 38G by Khanh-Dang. In addition, you also need the ROM files from my emulator package because the saturn program doesn't include them. Download my package and just extract the files called rom.38g & rom.39g. If you want the aplet files that I created then you'll also need to extract 38gAplets.zip & 39GAplets.zip and create folders to contain their contents. You may also want to extract the Readme.doc file because much of the information will still be relevant. This program is only for the HP39G & 40G which use the serial port not the USB of later models. A Help file explaining how to use both of these. This is a single package containing everything that you need to have if you own an old 39G or 40G. You'll need to purchase your own cable, however, since one did not come standard with the machines (see Sampson cables on my links page). The HPGComm program lets you send and receive programs, notes and aplets to/from the the PC. The ADK39 lets you edit them on the PC and the Help file explains it all. Just download the package into an empty directory, unzip it, and read the instructions on how to install them onto your PC in the README.TXT file. This is an aplet, adapted by the author from an existing HP49 program, which enhances the HP's ability to handle graphics. Firstly it allows you to work on all of the screen (131*64 pixels) and not just the 125*64 offered by the built-in Sketch editor. Secondly, HP-Paint allows you to zoom in on a part of the grob. This really comes in handy when you want to put fine detail in your images. Thirdly, in HP-Paint you can shade parts of the grob with different patterns: Lines \\, Lines \\(2), Lines //, Lines //(2), black and even with a custom pattern. Finally, you can make the interior of the boxes you draw either black or white, rather than the empty interiors in Sketch. In addition to this it offers everything the built-in sketch editor offers. Click on either icon to download it. The zip file contains versions for both the HP38G and the HP39/40G. Authors: HP-Poska (conversion to 38/39/40G). Originally by François Darras, Erwan Ancel, and Laurent Mallet. If you'd like a version of the EMU48 emulator (see above for the PC version) that will run as an App on your iPhone then check this site out. I've not used it myself so I've no idea how good or bad it is. I don't own an iPhone so I can't test it. This utility aplet is ONLY for the HP39G & HP40G. Do not use it with later models! The internal keybounce time is set in order to prevent a key registering twice. When you press a key you may only hold it down for a fraction of a second but to the calculator this is a LONG time and if there were no delay set then it might, for example, read what you meant to be a '3' as a '33'. However, on the HP39G & 40G, the default factory setting of 166.6ms delay is a little high and sometimes causes a REAL press of '33' to only register as a single '3' when you actually meant 33! Changing the delay value to a setting of around 75ms will reduce the chance of this happening. When you first run the aplet it will display the current delay time. For an HP39G this is 166.6 milliseconds. You can alter this to any value from 0 to 400. Based on our experience a good value to try is 75ms. Once the value is set it will remain until a memory reset (ON+SK3 or ON+SK1+SK6) is performed on the calculator. Deleting the aplet will not affect it and, since the aplet is only 1.3Kb in size, it may be worth retaining. This is not a complete cure for the problem but it does seem to help. This program is called HPGComm and will run with either an HP38G, HP39G or HP40G. It allows you to upload or download aplets, programs etc from the HP38/39/40G to a PC. This program will run on Windows '95, '98, NT, Me and XP. Note: You must already have the cable to be able to use this software. The cable did not come standard with the calculator. See Sampson Cables on my Links page. This software was written by James Bergamin in Switzerland, with helpful criticism from me. It is not sold by nor supported by Hewlett Packard, although you can download it from their web site. Note: Although HPGComm has a help file it is rudimentary and I wrote a better one that included instructions on how to install and use HPGComm and the ADK for both the HP38G and the HP39/40G. It is unfortunately not linked into the HPGComm program so you have to run it separately, but I have managed to link it into the installation routine for the new HP39G ADK (see above). If you install the 39G ADK then a shortcut will be created in the program group created for the ADK on the Windows Start menu which also points to my help file. Warning! A bug was found in the initial release of HPGComm. If you downloaded it before July 2nd, 2001 then you need to download and install a replacement version in which the bug is fixed. This version is for people whose server will not allow them to download exe files. Eg some schools. This version will only edit or create HP38G notes or aplets. A utility is available (below) to convert HP38G objects to HP39/40G objects. A version which will operate directly on HP39/40G programs, notes and aplets is available above. This utility converts any files that were saved from or created for an HP38G into files that are compatible with all later models. It it works fine with notes, lists, matrices and ordinary aplets.